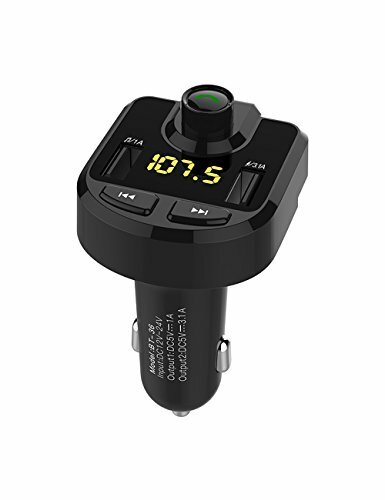 Set your hands free with hands-free call enabled by the BT36 Bluetooth FM Transmitter Car Kit. CVC noise cancellation technology guarantees you crystal sound for making and receiving calls. Switch to hands-free mode automatically from music playing or FM mode when receiving calls. Tune your FM Transmitter and your car radio to the same blank frequency. Then you can enjoy your favorite music via Bluetooth, USB Flash Drive and TF Card delivered through FM Transmitter to your car sound system. With 2 types of USB charging ports: One comes with 3.1A for fast charging, and the other one comes with 1A for standard charging. Support simultaneous charging for driver and passenger. The 1A USB charging port also supports USB disk reading for music playing. Clearly show real-time car battery voltage for you to diagnose battery status in time. Support frequency point, the sequence number of songs and working status display as well. Hands-free Phone Call - Built-in high-performance microphone equipped with CVC noise cancellation technology to give you crystal sound for making and receiving calls, Incoming Call Number Announcement, Support Last Call Redial. Keep user away from static noise. Dual USB Car Charger - Support charging two devices at the same time. 5V/3.1A USB port offers fast charging, 5V/1A USB port can read USB MP3 music and standard charrging. Multiple Music Playing Modes - Enjoy HiFi Music via USB Flash Drive (up to 32GB); Play Music via TF Card (up to 32GB); Play Music directly via Bluetooth. Support MP3/WMA/WAV files. Universal Compatibility - Suitable for all Bluetooth enabled devices, such as iPhone, iPad, iPod, tablet, Samsung Galaxy, HTC, Google, LG, Sony and other Andriod Smartphones. Compact design makes it easy to fit in most 12V/24V car cigarette lighter socket. Voice Navigation - Navigation Voice can be automatically transmitted to your car stereo via Bluetooth when your smart phone is running Navigation. If you have any questions about this product by Anytech, contact us by completing and submitting the form below. If you are looking for a specif part number, please include it with your message.